We don’t talk much about games here on The Sweet Setup, but we’d be lying if we said we don’t play games on our iPhones and iPads. There are a few mainstay games that every iOS user should purchase — games like Threes!, Monument Valley, Angry Birds, and even Super Mario Run are enjoyable again and again, no matter how long you’ve gone without playing. That list is moot if Alto’s Adventure isn’t included. 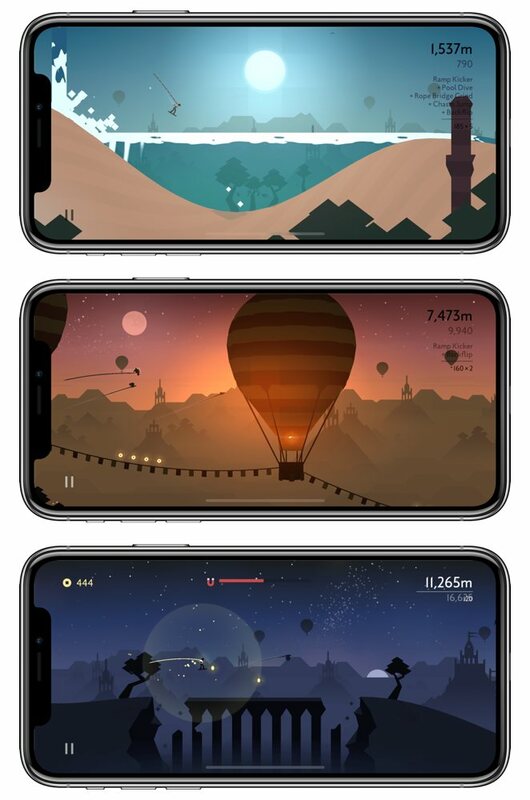 Alto’s Adventure, developed by Snowman in Canada, was launched in 2015 as an endless runner snowboarding game that combined increasing difficulty, an addicting set of achievements and levels to work through, a wonderful soundtrack, and a beautiful set of in-game artwork sure to take your breath away. 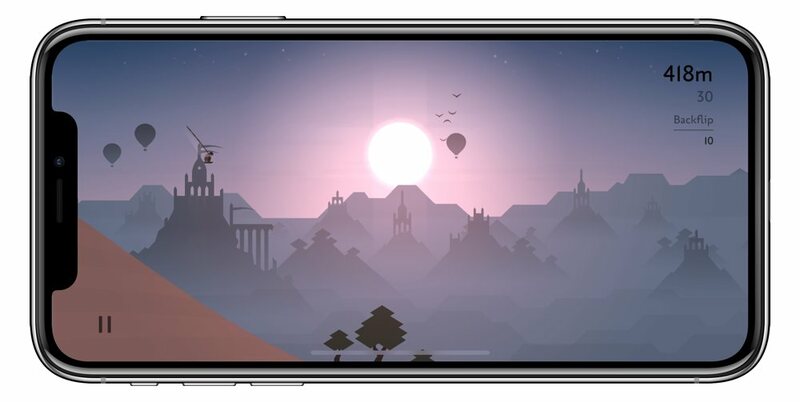 Alto’s Adventure went on to enormous success, garnering immense praise from the tech journalist community and being labeled an Editor’s Choice game by Apple’s App Store team. Any game with the praise and success of Alto’s Adventure is sure to see a sequel down the line, so Alto’s Odyssey has been expected since the moment we took our first runs down the mountain. Odyssey was originally scheduled for launch in Summer 2017, but was delayed — until today. Alto’s Odyssey isn’t a regular sequel as we’ve come to expect these days. Odyssey can be played on its own and doesn’t require any knowledge or prior experience with Adventure. Instead, Odyssey takes the very best of what made Adventure such a success and adds new tricks, new locales, a new soundtrack, and plenty of new breathtaking moments to ensure new and experienced players will come back in the years ahead. 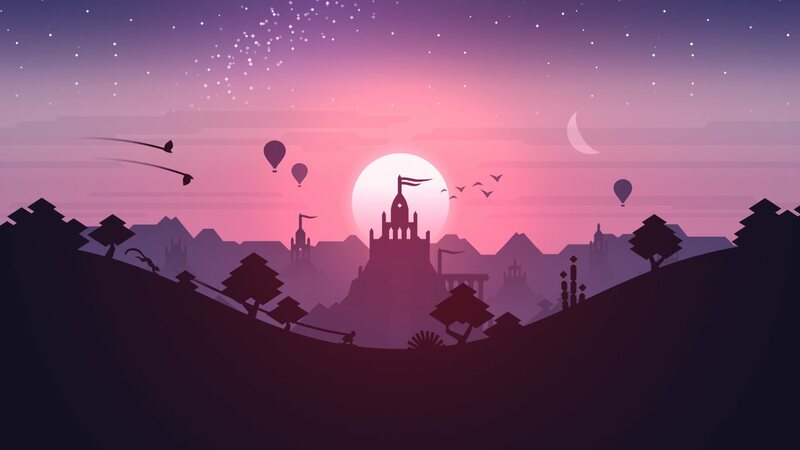 Alto’s Odyssey is largely a reincarnation of Alto’s Adventure, but with its own unique gameplay features that will require their own set of mastery. Gone are the masked sheriffs patrolling camps found in Adventure, along with the iconic llama’s racing down Adventure’s endless mountain. Both have been replaced by far cuter — and far faster — lemurs, as well as coin pots scattered throughout the endless desert. If lemurs and coin pots weren’t enough, Odyssey introduces wall rides, bouncy balloons, waterfalls and river streams, and long vines that give out after lengthy grind sessions. With these new elements, Odyssey develops its own challenging character and grows on what made Adventure so great. I’m a particular fan of wall-riding — one of Odyssey’s newest gameplay skills to master. Press and hold as you jump onto a rock formation with little studded diamonds, and your sandboarder will ride the wall and jump off for extra hang time. Wall-riding becomes important at different parts in the game, specifically when you’re asked to wall ride upwards across a chasm. This adds a unique challenge, different from Adventure, and gives the game an added sense of accomplishment when you string together a longer set of tricks. 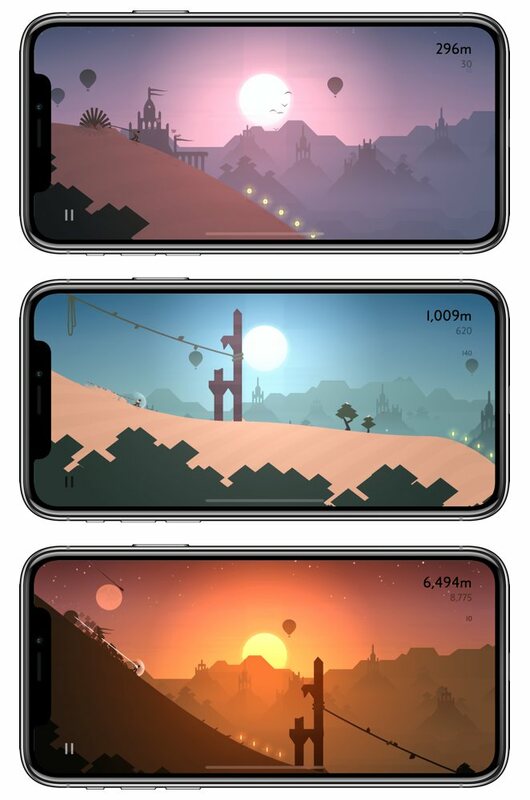 Alto’s Adventure became instantly recognizable in the weeks after its launch in February 2015, as the modernist in-game artwork spread from the opening launch down the mountain through to the awesome zoomed-out chasm jumps. That modernist artwork has spread to Odyssey and its sand dunes, but in a refined and extrapolated sort of way. Each landscape inside Odyssey has a certain character to it, be it the aforementioned sand dunes, the pixelated waterfalls, the Roman-ruin-like columns, or large rock formations. Jump after jump renders shots of vivid color, from the dusty reds of a windy desert to the purplish hues of a starry desert night sky. There is nary a moment in Odyssey where you don’t want to pause the game and take a screenshot. Odyssey’s sound effects and soundtrack are equally on par with its unique artwork. From the custom soundtrack — which is best consumed in Odyssey’s Zen mode and a good set of noise-cancelling headphones — to the sound of a sandboard zooming across the desert landscape, Odyssey is sure to whisk you into a zen-like world that’s hard to let go. There are also a bunch of refinements in Odyssey, as seen and heard when you ollie off a ramp or off a cliff, or when you land a sweet trick, or when you find a Bird of Paradise zooming across the screen. You can even hear the wind rushing past your ears when you double-backflip off the edge of a cliff. I never noticed these smallest details in Adventure and they work to give Odyssey its own fit and finish. Of course, it’s the serene combination of simple color — both visual color and audio color — that made Adventure the massive success it was. For many people, Adventure offered the right combination of zen and skill, allowing them to forget the day’s troubles and be whisked away into a soothing and relaxing snowboard ride down the mountain. Snowman wisely realized where Adventure’s strengths lay, and doubled down on those successes in Odyssey. The result is a game with a special balance of artistry, sound, and music sure to ease your concerns for at least a few hours. I admit to having very (very!) few games on my iPhone over the years. I can count on one hand the number of games I’ve enjoyed enough to download on a new iPhone each September. 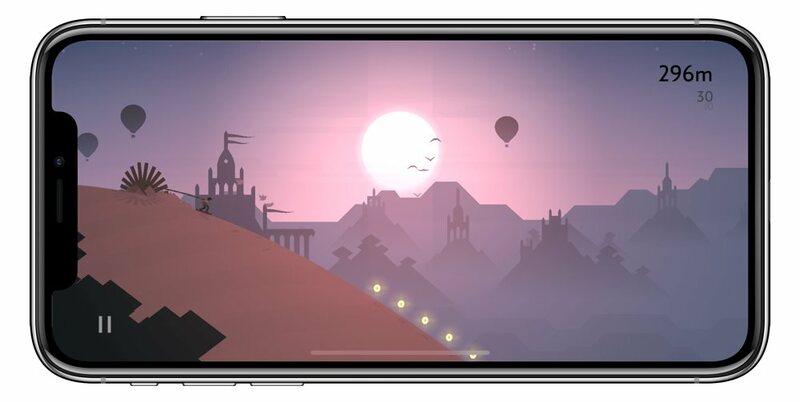 But, Alto’s Adventure has been one of those few games nearly every September since release. My expectations, therefore, for Odyssey go without saying. I’d expect Odyssey to be at least as addicting as Adventure, but to have a set of refinements and new environments to explore and admire. To that end, my expectations have been met. Yet, the further inclusions and additions to Odyssey — like wall-riding and balloon-bouncing — make for new challenges that are sure to require mastery over many hours of spare time. I momentarily miss the semi-scary suspense of being chased by Adventure’s terrifying masked horsemen, right up until the moment where I’m trying to string combos together with wall rides and balloon bouncing. Alto’s Odyssey is a worthy sequel to the groundbreaking Adventure title. This is one of those no-brainer game purchases, sure to bring a smile to your face for years to come. You can purchase Alto’s Odyssey for $4.99 on the iOS App Store.